This month’s Five Star classic film is 1937’s witty, sparkly screwball comedy The Awful Truth. Nominated for six Academy Awards (Best Picture, Director, Actress, Supporting Actor, Screenplay and Editing), the film won a single, high-profile Oscar: for director Leo McCarey. When looking at reasons why this film is so wonderful, McCarey’s contribution is a great place to start …. Born at the tail end of the 19th Century, Leo McCarey studied law before trying out a number of disparate jobs. He eventually embarked on a film career in his early twenties – initially as an assistant director and comedy writer. He worked with many of the early comic greats, including Harold Lloyd, W.C. Fields, Laurel and Hardy and the Marx Bros (stars of previous Five Star Film A Night at The Opera: see here for more on this comedy classic). Though extremely skilled as a comedy director, McCarey also directed dramas, including the famous romantic drama and beautiful tear-jerker An Affair to Remember (1957) - which also starred one of the leads from The Awful Truth: Cary Grant (more on him shortly). McCarey was also one of the first of a short list of directors who received Academy Awards for Best Picture (as Producer), Director and Screenplay: for 1945’s Going My Way, starring Bing Crosby. - Cary Grant’s terrifically over-the-top fake tan (courtesy of a sun lamp, and meant to keep his wife from knowing that he lied about being in sunny Florida on a recent trip) that makes for a great sight gag – clearly visible even in black and white. - And everything to do with the film’s dog character Mr. Smith (more on him later). The Awful Truth stars the magnificent pair Irene Dunne and Cary Grant, as married couple Lucy and Jerry Warriner. Dunne’s role here was her most famous, and the one for which she received the third of her five Academy Award nominations. The Awful Truth was relatively early in both stars’ thirty-plus year film careers (Dunne in her seventh year, and Grand in his fifth). It was also the first time the two would play co-leads in a film. Their subsequent pairing were Garson Kanin’s My Favourite Wife (1940) and George Stevens’ Penny Serenade (1941). My Favourite Wife, like The Awful Truth and Howard Hawk’s His Girl Friday (1940) were known as ‘re-marriage comedies’, with comic storylines revolving around separated (through with divorce, estrangement or incorrect presumption of death) couples getting back together. The latter film also starred Grant (without Dunne, but with the fantastic Rosalind Russell (for more on this previous Five Star Film, see here . And while we’re on Grant, see here for another Five Star Film, and one in which he played one of his most iconic roles: Roger Thornhill in Hitchcock’s 1959 classic North By Northwest). Dunne and Grant’s film chemistry was electric. They sparred so beautifully. Their verbal and physical timing was impeccable; their rapid-fire retorts were perfectly pitched. One of the great zingers of the film is when, mid-fight, Lucy tells Jerry ‘I wouldn't go on living with you if you were dipped in platinum’. Interestingly, much of the Jerry/Lucy dialogue in The Awful Truth was improvised by McCarey and his cast on set. It’s been said that many of Grant’s/Jerry’s mannerisms in the film were actually impersonations of McCarey (who, by all accounts, was handsome and charming – just like his leading man). One of the best scenes in the film sees Jerry trying to get Lucy’s suave European piano teacher / presumed lover, Armund Duvalle (played wonderfully by Alexander D’Arcy) out of the Warriner apartment. Grant skillfully manages that difficult delicate balance of playing ultra-polite, while simultaneously being rude and insulting to Armund. Armund seem impervious to insult, and Lucy just plays it straight. The result is hilarious. One of the stars of The Awful Truth was a dog named Asta (well, his stage name was Asta, as his birth name was actually Skippy). Asta also starred in the famous The Thin Man film series (1930s and 40s) and would work with co-star Grant the year after The Awful Truth, in Howard Hawks’ Bringing up Baby (1938). - …. and is later called back into court as a special witness. The judge (Paul Stanton) has one of the film’s best lines, when he (with a straight face) orders his bailiff to ‘Send for the dog’. - An absurd (and very funny) scene where Mr. Smith plays a type of hide-and-seek with Jerry and Armund’s derby hats. 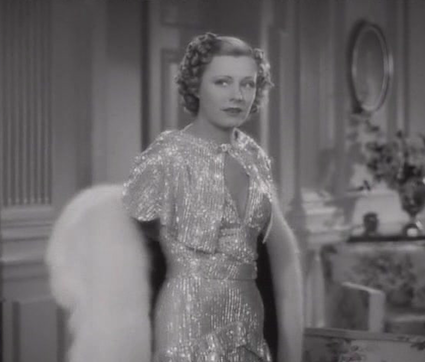 Irene Dunne’s gorgeous gowns in this film were designed by the impeccable designer Robert Kalloch. Kalloch was also costume designer on previous Five Star Films Mr. Smith Goes to Washington (see here ) for more on this Frank Capra classic) and the above-mentioned His Girl Friday. There are many noteworthy wardrobe ensembles in The Awful Truth – two of which deserve special mention. The first is the one in which Dunne’s Lucy makes her first entrance. She’s is wearing a fabulously ridiculous white fur coat. The coat is so fluffy that it’s about three times wider than Lucy’s body – and means that she can’t get through a door without brushing against it. There’s a lovely comic moment when Lucy hugs Jerry while wearing it - and his face gets obscured by the fur. He’s forced to push the fur down from in front of his face so that he can see. When Lucy takes off the coat, we see a stunning Kalloch creation underneath. It’s a luscious light-coloured sparkly dress, and it looks spectacular: fully beaded, with an interesting short cape over a v-necked bodice. With every movement by Lucy, the dress comes to life, shimmering and reflecting light from multiple angles. Another extraordinary Lucy gown is also fully beaded, this time in black. The reflecting light is even more impressive against this dark number, as the sparking light makes it look like the dazzling dress is actually electrified. Supporting cast member Ralph Bellamy is deserving of special mention. Bellamy was perfect as the rich, though hick ‘gee Ma, oh shucks’ semi-bumpkin, who’s planning to marry the leading man’s ex-partner. Incidentally, Bellamy played a somewhat similar role in His Girl Friday – where he also planned to marry Cary Grant’s ex. Here in The Awful Truth, Bellamy’s character was Oklahoma-born Daniel Leeson. Leeson’s naiveté was in sharp contrast to Lucy and Jerry’s urbane manner. Daniel’s facial expressions are wonderful. Bellamy played him as a successful business man, but one who isn’t particularly suave, relaxed or cluey in social situations. TheAwful Truth truly is a joy to watch, and no less charming over three-quarters of a century after its release.